I missed the opening ceremonies of the Summer Olympics 2012 and was beginning to feel I had too many other obligations to sit tight long enough to get through any of the events. Then came my surprise trip to Kansas with my son Adam. One of the unexpected blessings of that trip was having a chance to watch, nearly every evening our our visit, the Olympic competitions in the living room of our long-time friends, Bert and Joanne Zylstra. Though I always love watching swimming, diving and gymnastics, track will always have my heart. In my younger years, track was my lifeblood — something that gave me purpose and helped me realize things about myself that I wouldn’t have discovered any other way. And when I watch the track events at the Olympics, it all comes back to me — the mental preparation, the hyperventilation, the sheer exhilaration. Watching the racers get ready for their events, I’m there again, waiting for that gun to go off and for my life to be forever changed by the results of that two-and-a-half-minute 800-meter race. Though I hadn’t been recruited, I decided to get involved in track my freshman year of college. Unlike most of my teammates, I wasn’t on scholarship and I didn’t have plans to go into the fitness field that would keep me on the track forever. But I proved myself worthy of being part of the team by placing well and qualifying for indoor nationals in middle-distance events, and even made it onto the All-Conference Team. I set personal-best records and was in the best shape of my life. 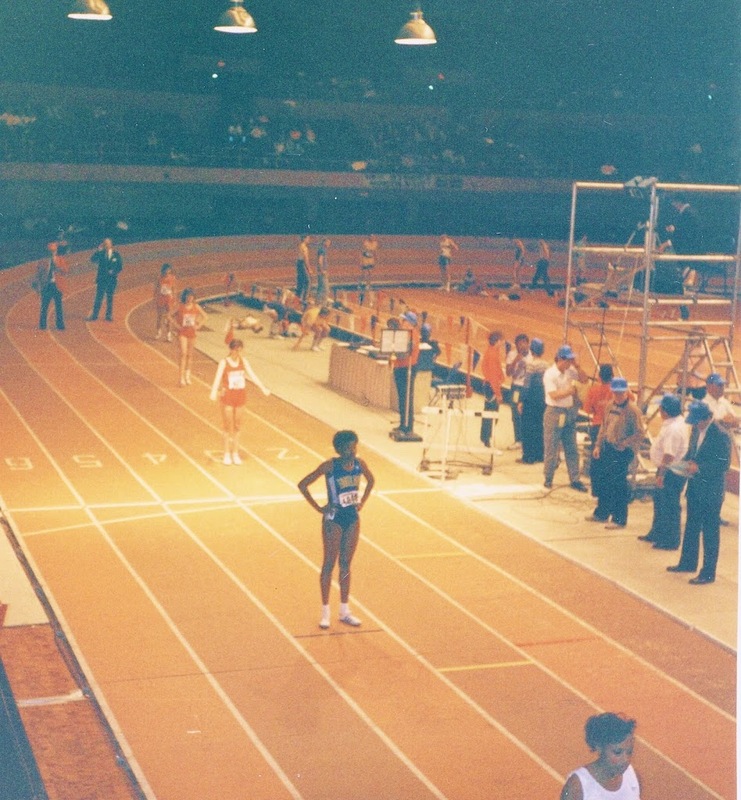 The indoor national track championships in February 1987 took place in Kansas City, Missouri. 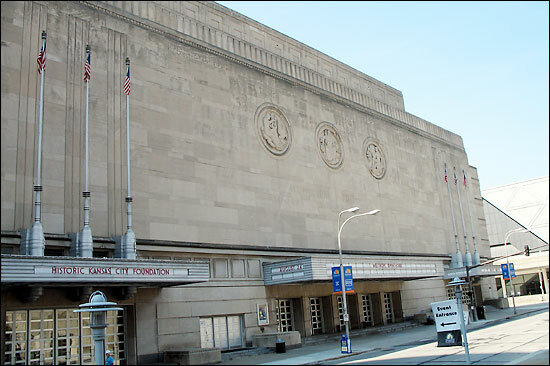 Because they lived nearby, the Zylstras stopped by the Hotel Phillips where our team was staying, and also showed up at the Municipal Auditorium to watch me compete. A few days into watching the Olympics earlier this month while in Kansas City, Joanne reminded me of this moment in time and mentioned she had some photos from that night. 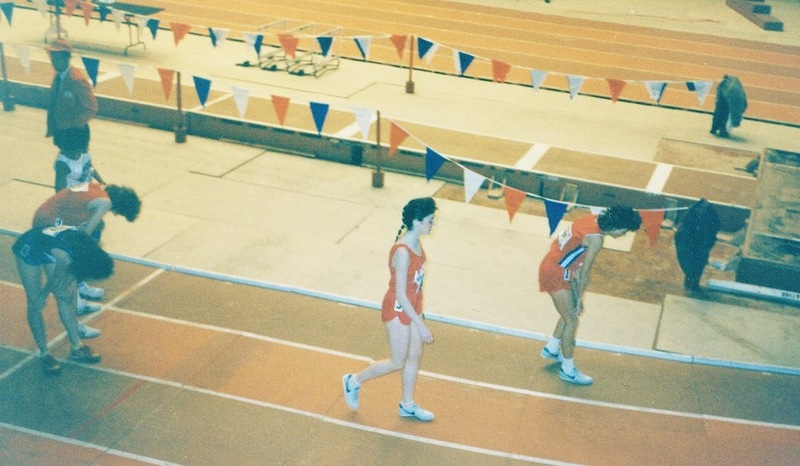 I had never seen them before, and though they’re not the highest quality, I enjoyed looking back on the images of my younger self during the climactic moment of my track career. I’m the first girl in red, getting ready for my race. I remember feeling incredibly nervous. I’d never competed at such a huge event and it was very intimidating. And…it’s over. Ask me how I did and I can honestly say, I don’t recall exactly how things ended up. Obviously I didn’t win. But what I do remember is that the track was wooden and raised at two points, and as we ran, it sounded like a thundering herd of rhinos. It was also on the scary side. I truly thought I might fall off the edge of the raised portions and I know this affected my performance — that and the fact that I was so in awe of the whole setup. Despite the results, that meet ended up being the height of my track career. I’d made it further than I’d ever imagined and had the chance to compete against the best in the nation. What an honor! Two months later, during try-outs for outdoor nationals, I was tripped in a race and ended up being rushed by ambulance to the hospital to have a torn ligament repaired. Though I attempted a rebound the following fall, it was never the same after that. 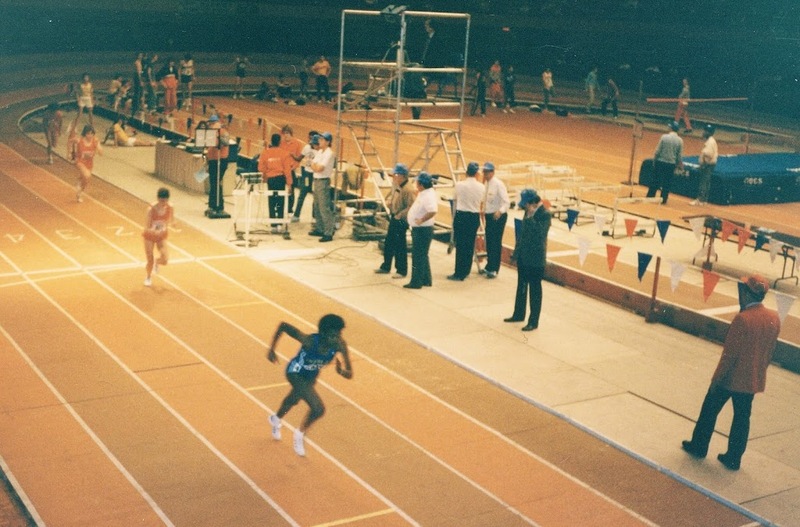 I couldn’t get myself as psyched up about track as I’d been before my injury, and eventually, I let go of my racing ambitions and started turning to other pursuits that were calling to me to experience. To this day, my bad knees remind me daily of that injury. I have a scar, too, on the outside of my left knee to help me never forget that time in my life. And yet, that wound also prompts the spark of a memory of an incredibly special time for me, when track had become an important outlet — a place to give me something to work toward and put other things in my life in perspective. It was an endeavor that helped me discover the power of the mind and will, and showed me that if I set my mind on something, anything was possible. And so, though my time of competing is past, when I watch the summer Olympics every four years and look at the faces of those in the running competitions, I understand what they’re going through, and as I’m reliving my own emotions from years gone by, I’m silently rooting for them, knowing that the race they’re about to run holds the power to change them forever. Q4U: Does watching the Olympics spur any memories or feelings for you? what fun pics of you! I loved track, too. My favorite was running the 300 meter hurdles. What i wouldn’t do to be able to run the hurdles now. Thanks for helping stir up some good memories. I knew that you competed in track, but I had no idea that you competed at the national level. How wonderful! And, you really haven’t aged since 1987. I was never in track and don’t like running. Loved your remembrances in this post, though. How fun. They Olympics reminds me of time spent in the living room together with my family while growing up. Marie, oh, I love you, even though I’m shaking my head, thinking, I have aged. 🙂 I’m a kid at heart still. Mary, you’re so funny. “I was never in track and don’t like running.” You’ve always been honest. That’s one of the things I love about you. 🙂 Thanks for reading anyway and that’s a nice memory of mine as well!